I fell in love with photography for many reason, but I think my attraction to it is primarily driven by the process. The way in which several schools of thought have come together to create something that can be used to both interpret and represent reality is phenomenal to me. Deep Features: The depth of field tool—which lets you calculate near and far limits for your subject—is one of four functions found in PhotoCalc. A great part of the process of photography includes understanding the numbers. F-stops, shutter speeds, ISO numbers and a myriad of other little bits of science all come together with a mechanical process to create an image. Getting a handle on all of this to create the image you want when you want can be quite an undertaking. Adair Systems has created PhotoCalc to lend a helping hand in making those calculations as easy as possible. PhotoCalc is essentially a photographer’s toolbox, providing a group of widgets to do all the primary calculations for you as well as giving you additional information that could be crucial to getting just the right shot. After launching the app, choose your camera from PhotoCalc’s extensive list of options; these include not only every digital camera on the market (and many older models), but all film formats, including several cinema films. PhotoCalc offers four functions. 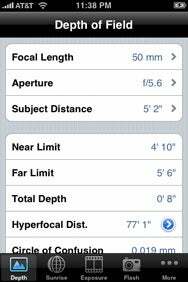 Its depth of field tool lets you calculate the near and far limits of the subject, as well as the total depth, hyperfocal distance and the size of the circle of confusion based on your the focal length, aperture, and subject distance data you enter. The sunrise tool, which can make use of the iPhone’s location-based features, lists all the times of the stages of daylight, including twilight’s beginning and ending, sunrise, solar noon, and sunset. The exposure reciprocation tool has three options: shutter speed, aperture and ISO. By locking one of these values to get the desired affect, the app calculates the necessary values to expose the image. Finally, PhotoCalc’s flash tool functions much like the exposure tool in that you have the options of guide number, aperture, ISO, flash power and subject distance—any of which can be locked to determine the proper settings for a flash exposure. As if all of that wasn’t enough, PhotoCalc also includes a robust reference library that features a glossary of photographic terms, commonly used filters, the zone system, and the Sunny 16 rule. From its stunning accuracy to an impressive library of incredibly useful information, PhotoCalc has managed to impress me time and time again and has become a much-welcomed addition to my camera bag. PhotoCalc is compatible with any iPhone or iPod touch running the iPhone 2.2.1 software update.